Folding Red Dot Walker by Medline Canada are designed for those who needs assistance while walking. Features a dual folding mechanism that works by simply pressing a button. Made of a lightweight Aluminium frame that is easy to take it around. 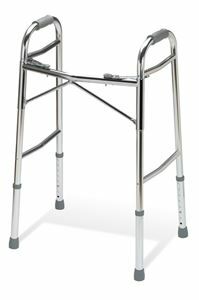 Comes with "K" cross braces on both sides of the walker to provide extra durability. Can be easily folded for a easy storage. Can hold to a weight of 350 lbs.